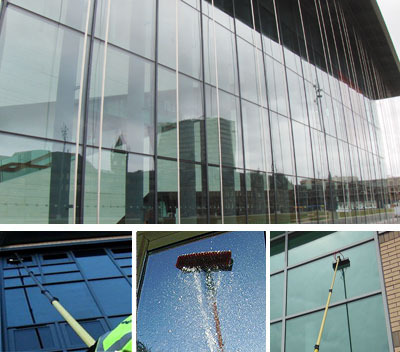 Our company provides a professional, reliable and high standard of window cleaning to both commercial and residential clients throughout Worcester and the surrounding areas. We are a reliable and trustworthy company who are uniformed, trained and fully insured. We use both pure water fed pole and traditional window cleaning methods depending on the type of property to be cleaned. Our aim is to put our customers first and maintain a high standard of work and friendliness to all of our customers. As health and safety is one of our main concerns, not just for our clients safety but for our safety too, the methods we use involve pure water fed pole window cleaning with the use of telescopic poles, which means we can clean your windows with 100% pure water up to 6 Feet (5 Storey) from ground level, giving an outstanding finish and also being able to reach normally inaccessible windows safely from the ground. Why Choose Clear Vision National Window Cleaning?